Charleston arguably has the best food in South Carolina! Here’s one of my favorite brunch spots in the city: Eli’s Table! The more I travel with my husband, the more I realize that we both come from family cultures that place a high value on eating well while travelling. Growing up, I didn’t understand why people didn’t like the food while camping, because we would have crazy good food even when sleeping in tents. (Think steaks, grilled anything, Dutch oven desserts.) This is awesome that we’re both on the same page here: if we’re going to splurge on something, it’s food. So when we headed to Charleston for a Sunday wedding to celebrate one of my favorite coworkers ever, we knew we wanted to get there early enough to get a great brunch. We had spent the previous night with some family at a beach town in South Carolina, so after a quick drive down to Charleston, we were ready to kick off our day of celebrating with some good food! On our way down, I did some research on Yelp (let’s be real, life is a little too hectic to plan very far ahead) and we settled on Eli’s Table right on Meeting Street. Mostly because the menu had a whole section of Benedicts. That in itself is a big sell in the Myrick household. Eli’s Table is right in the middle of downtown – I was sad we didn’t’ have more time to explore before the wedding, because it was great location! They don’t take reservations on weekends, but when we put our name in, they estimated a 30 minute time and it was only about 20! We got to wander around the street before they texted us, and I almost wished for more time to do some exploring. We got to sit outside, which was so picturesque and cute. We had a high-top table in the shade, sitting next to a fountain and under a tree. It meant that even though it was a hot day it was still comfortable to sit outside. Since it was a special occasion (and by this time our brunch was after noon), we started off with a drink with our lunch. Logan went with his favorite: an old-fashioned, while I went with one of their specials: something called a European Tour, which has Elderflower liquor with Italian brut. It was delicious: I’m a sucker for anything with sparkling wine for sure, and this drink was sweet but also light and sippable in the hot weather. Drinking it made me feel sophisticated. My sophisticated gorgeous drink, the European Tour. Logan and I really loved what we ordered!! unfortunately, as I write this, it looks like they’ve updated their menu and what we ordered has been tweaked from the time of our visit. Somehow both of them are now off menu! I promise we were there less than a month ago! Logan ordered a type of benedict that involved steak, texas toast, and steak sauce in addition to the poached eggs and hollandaise with a side of potatoes. Mine dish included poached eggs as well, on top of potatoes with a mustard sauce and greens on top. We shared an order of beignets as well: we were leaning hard into vacation mode. of what this reminded me of. They were dense and sort of flavorless. The sauce that went with them was delicious, but next time, I’d skip the beignets for something lighter. The service was good for the most part. Our waiter was excellent, attentive and joked with us a bit throughout the meal. Unfortunately the kitchen was way behind the day we went: we waited for our food for almost 45 minutes after we placed our orders. The waiter told us shortly after we order that it may take longer than usual and was very apologetic, which I appreciate. It wouldn’t matter to us that much normally, but we were under a bit of a time constraint with this wedding. We ended up having to rush through our meal once it finally arrived. So that was a bit of a bummer, but the food was so good! My take: definitely delicious! Eli’s Table is great food, good service, and great ambiance. 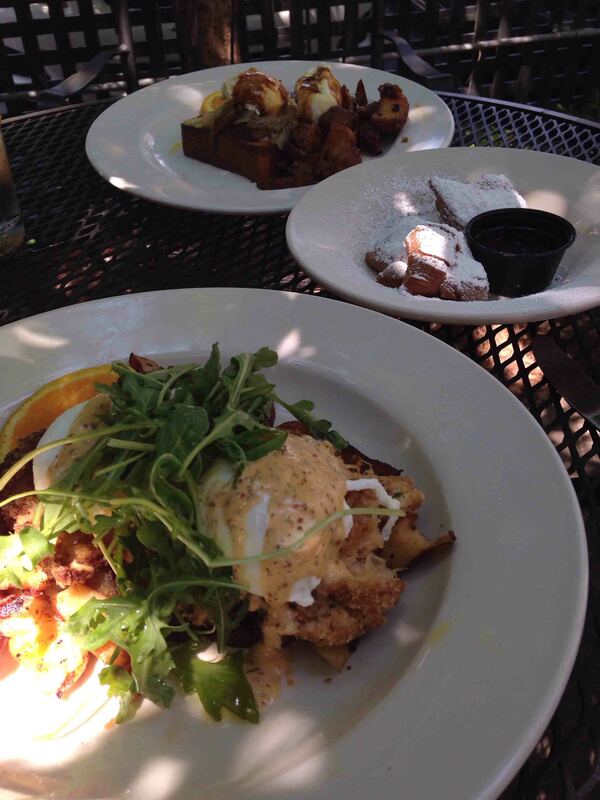 I’d go back for brunch when I’m not in a rush, or go back one evening to enjoy the outdoor patio again.